During early 20th century, establishment of two research stations, one at Ka rimganj (1913) and the other at Titabor (1923) paved the way, immediately after independence, towards setting up of the Assam Agricultural College (AAC) at Jorhat and the Assam Veterinary College (AVC) at Nagaon in 1948. 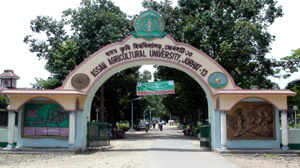 Later, on April 1, 1969 the Assam Agricultural University came into being through "The Assam Agricultural University Act, 1968", renaming AAC as College of Agriculture headquartered at Jorhat and AVC as College of Veterinary Science simultaneously shifting its site from Nagaon to Khanapara. Subsequently, College of Home Science (1969), College of Fisheries(1988), Biswanath College of Agriculture (1988) and Lakhimpur College of Veterinary Science (1988) were established. Similarly, few more regional research stations at Shillongani, Diphu, Gossaigaon, Lakhimpur; and commodity research stations at Kahikuchi, Buralikson, Tinsukia, Kharua, Burnihat and Mandira were added to generate location and crop specific agricultural production packages. To fill up talent gap in agriculture and allied sector to preposition the state to combat the emerging challenges in agriculture and ensure productivity increase in agri-horti-animal-fish crops on the face of shrinking/fragmented land holdings, ailing soil health, diminishing water resources and increased human population.